Miles Halter is looking for something beyond what his public school in Florida can offer. He’s in search of, as François Rabelais phrased it, the “Great Perhaps.” This determined journey of discovery leads Miles to Culver Creek, the Alabama boarding school that his father also attended. His new roommate is a scholarship kid who prefers to be called the Colonel and gives Miles his very own nickname, too ("Pudge"). But the center of Miles’s universe at Culver Creek is the smart, beautiful, and one-of-a-kind Alaska Young, whom he’s instantly smitten with. Under the guidance of the Colonel and Alaska, Pudge is pushed out of the safe confines of his old life and into whatever awaits him beyond it. 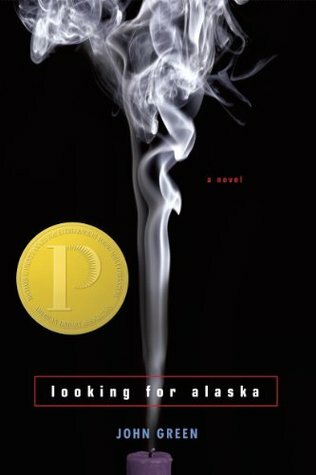 When I decided to check out one of John Green’s books at last, I figured that I’d start from the beginning, with Looking for Alaska. I had a rather odd journey reading this book. After reading a few chapters, I just couldn’t get into it and set it aside for almost two weeks. With the library due date looming, I somewhat reluctantly picked it back up. The hiatus ended up being a wise idea because when I resumed reading, I became a lot more interested in the story. Even as I write this review, I still can’t precisely describe why I found this book so difficult to warm up to. Green is certainly an exceptionally talented writer. I get why he’s so popular. If I’d read Looking for Alaska when I was sixteen, I’d be worshipping him as a god, too. The thing is, I’ve been out of high school a long time, and looking back, I feel quite inadequate, bordering on ashamed, for not having read Rabelais or even having heard of Rabelais as a teenager. I also don’t recall pondering some of the profound topics that the teenage characters in this novel sometimes do, further making me question if I spent my adolescent years doing anything useful at all. There were times when I thought that Miles, Alaska, and the Colonel would have felt right at home among post-collegiate hipsters. Green’s writing has this mega-cerebral quality to it, and it didn’t always click with me. Another contributing factor to the rocky start that I had with the book was that it seemed like nothing was happening. Contemporary, character-driven novels can be hit or miss with me, and this one was looking like a big miss. Miles sets off for Culver Creek. Miles meets the Colonel. The Colonel dubs Miles “Pudge.” Miles meets Alaska and can’t stop thinking about her . . . and so forth. I kept waiting for all of the talk about bufriedos (deep-fried burritos) and Weekday Warriors (the local rich kids who go home on the weekends to their rich families) to lead up to something momentous. And I kept waiting. Perhaps it was taking a break from the book that gave me some time to digest its pacing, so that when I began reading it again, I just went with the flow of the narrative. If I’d taken that approach from the get-go, I might not have gotten so frustrated with it in the beginning. So why am I giving the book four stars? I did take an immediate liking to the Colonel because he radiated snark, and he was my favorite character until the end. I mean, I have to love a guy who attends basketball games just to heckle the other team and get ejected. The “After” part of the novel is riveting; it’s heartbreaking and poignant, yet filled with enough of Green’s inimitable brand of humor to prevent the book’s tone from becoming too melancholy. Finally, I cannot deny that John Green is a genius. The writing here is brilliant, even if it’s not exactly the type that speaks to me the way that it does to other readers. In the hands of the right reader, there’s a lot to love about Looking for Alaska. When it comes to contemporary, YA, Printz Award-winning novels set in boarding schools, though, Melina Marchetta’s Jellicoe Road remains my top pick. Did I suspect that this book would be amazing? Yes! I was right; John Green can deliver nothing less than amazing! Looking for Alaska is the second John Green book I have ever read. Even though it wasn't my favorite Green book, I still enjoyed it. The thing about Green's books that is so appealing to me, besides the humor, is the characters. Pudge was a great young lad, and I loved his obsession with famous last words. After reading this, I Googled some famous last words to sate my own curiosity. This leads me to another thing about Green—his characters are relatable. They aren't cardboard relatable either, where the characters are so bland that anyone can put himself or herself in the characters' shoes. I felt for Pudge. He was trying to become adventurous any way that he could. Alaska was also pretty cool. To me she was the epitome of teenage rebellion. Sure, she had her problems, but hey, nobody's perfect. The last character that I really want to mention is the Colonel. I loved this guy! He was this short little prankster/mastermind, and the book wouldn't have been the same without him! The storyline was very interesting. You're pretty much following Pudge's life, watching as he truly begins to live. The relationship between him and his friends was quite moving. The end really caught me off guard. It wasn't a big old mystery, but I just couldn't believe it was happening! The only thing that I can even think of that might have bothered me about this book was the sadness. But as every Nerdfighter must know, most of John Green's books come with a good dose of misery. He just has a knack for writing deep, depressing, memorable stories. I think that's secretly why I like 'em so much. It's a John Green book—go and read this amazing piece of literature. I love this book! Read it a few years ago after 13 Reasons why. I totally forgot about it til recently when I borrowed the book from the library that I remembered. Lovely review ladies, happy to see your take aways from the story. Remembering last words is a real cool knowledge to have. I think Ally read 13 Reasons Why a while back; I've still got to read that one. And Miles certainly had a knack for recalling famous last words; very cool, indeed.